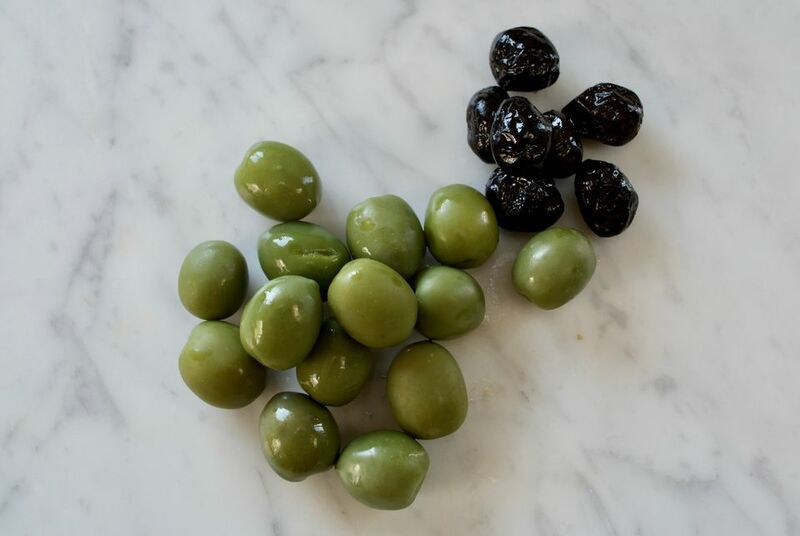 If you cook enough and like olives, it's bound to happen: you have olives, a recipe that calls for olives, and yet the olives still have the pits in them. Luckily, pitting olives at home is pretty darn easy. Smash them. Yep, you're going to smash the olives. It's best to do them one at a time, but depending on your tool, patience, and desire for perfection, you can work in small groups. 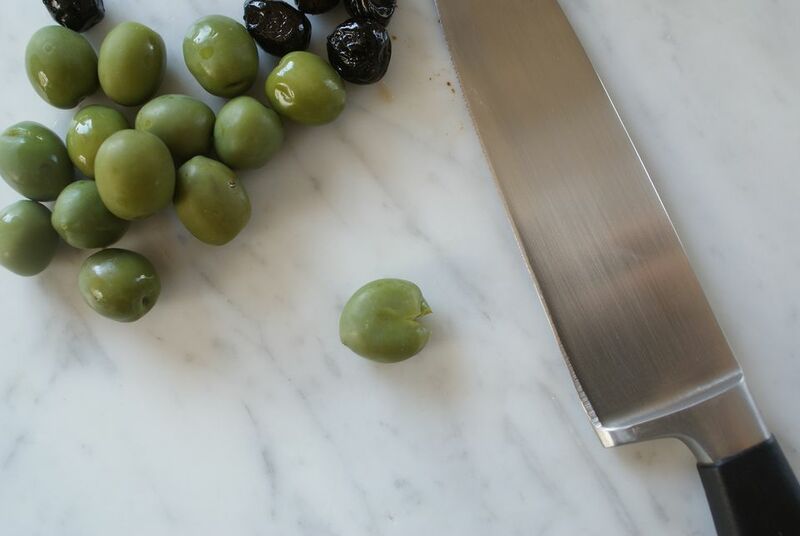 Use the flat side of a large knife blade (as pictured), meat pounder, small frying pan, or other heavy, flat surface—even the bottom of a mug will do if yield the right way—to smash the olive gently but firmly. You need to use some force, and getting out some pent-up aggression is fine, but you don't want to pulverize the olive (or the pit for that matter). The gentle but firm smashing should yield an olive that looks about like the one pictured above: still somewhat olive-shaped and whole but split open along one emerged seam. If the olive hasn't popped open, try again. If it isn't "open" you won't be able to get the pit out! The smashing should have essentially released the olive's hold on its pit. The pit should pop right out or, at most, you'll need to pull it out easily. So now you have a pitted olive. Congratulations! What to do? Add to salads or antipasti platters for easy eating or chop and add to dishes like tuna olive caper pasta or cauliflower pasta. Note that if you're not careful olives pitted this way will be a bit... mangled. A bit of care will yield an olive perfectly pitted and ready to stuff or otherwise use somewhat whole. Use less care and this method is best if you're planning on slicing, chopping, or mashing them up anyway. For pitted olives that look truly pristine, you'll need to either buy them that way or buy an olive pitter. With a bit of practice, you'll be able to smash them just enough to be able to pull the pit out easily while leaving the olive not looking too shabby. If you're going to chop them for a sauce or mash them up into a tapenade anyway, go ahead and really smash away—it's fun and gets out a nice little bit of aggression if your day calls for it!